Utoothia Magic – We are back in Utoothia and there is a lot going on again. For a long time, the Tooth Fairy and the inhabitants of Utoothia have lived in peace and harmony, but suddenly Plaksta is planning new attacks against the beautiful kingdom. He has founded a new Crobie army. This time he wants to send purple one-eyed Corbies and blue super-powerful Crobies to fight in Utoothia. They have to help him attack and weaken the Tooth Fairy. Plaksta’s aim is to win the whole kingdom for himself and let it sink into darkness. He hates the sun and he can’t live in the daylight. It is for this reason that he wants to bring darkness to the kingdom. Therefore, the Tooth Fairy starts leaving the kingdom to fight against the Crobies with her magical wand. She meets the Crobies in very different and colourful landscapes and places. With her wand she can freeze and beat the Crobies. The better the inhabitants of Utoothia clean their teeth, the stronger and brighter the sun shines over Utoothia and the weaker the strength of Plaksta and the Crobies. If everyone always brushes their teeth regularly, the Tooth Fairy will be able to fight against the Crobies and she will successfully defend her kingdom. 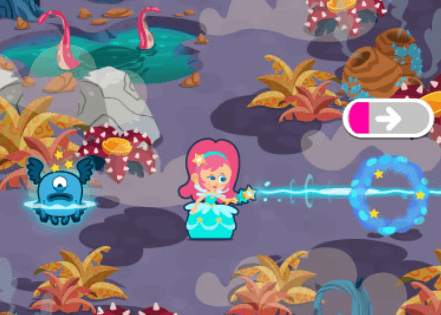 The Tooth Fairy is getting more powerful with the passing time and she manages to fight against Plaksta and the Crobies. For Plaksta, achieving his aim is getting more and more difficult. He wants to let Utoothia sink into darkness and get the power over the kingdom. The laser, that comes out of the Tooth Fairy’s magical wand, is constantly changing colour and level of power against the Crobies. As long as everyone keeps brushing their teeth accurately and regularly, the Tooth Fairy can beat the Crobies with her colourful wand and other tools. By freezing and beating the Crobies, she gets even more successful and she wins new power teeth. Even if the Tooth Fairy is fighting alone, the support and help of her inhabitants are so important! The people of Utoothia get stronger after seeing her triumphs and they can produce new tools for the Tooth Fairy for her successful battle. They are all supporting the Tooth Fairy. Fighting all together, their combined united strengths manage to overpower the Crobies and send Plaksta back to his dark cave. The weakened mean ogre Plaksta finally accepts defeat and he retreats back to his distant cave that he calls home, far far away from the kingdom of Utoothia. Utoothia can now celebrate with the Tooth Fairy and they are all really happy to have defended their kingdom so successfully together!